S-27 is a powerful play currently onstage at Annex Theatre as part of Toronto Fringe Festival. The play was inspired by photographs taken of prisoners at a Khmer Rouge prison in Cambodia. At the prison where the photos were taken, 14,000 entered. 7 survived. Sarah Grochala won Amnesty International’s Protect The Human Playwriting Award in 2007 for S-27. This mounting marks the play’s North American premier. The play addresses the fact that we tend to value people we know more than equally deserving strangers. 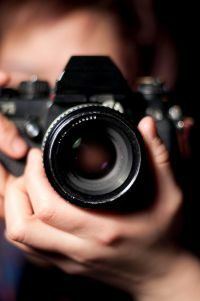 May (Melanie Hrymak) is a photographer responsible for taking the “mug shots”. She is mean and threatening to the prisoners. After she takes the picture, she sends the prisoners off to certain death. May has a shred of decency though, unlike her assistant June (Raechele Lovell). June is ruthless. She tortures people and kills them with her bare hands. June is a monster and finds pleasure from her work. When the tables, or camera, are turned, we see a very interesting side of her. She becomes more human. Hrymak and Lovell are great throughout, and this scene is fantastic. Six characters are played by four actors. The actors are Ann Duong, Jesse Bond, Meaghen Quinn and Joshua Browne. All four are exceptional and hugely believable. There is great chemistry between them all. S-27 is thought-provoking and intense. There is violence. There are people doing horrible things to one another and horrible things to stay alive. This play is not for the squeamish. However, no pain equals no gain. It’s also very worthwhile. One minor thing that bothered me was the language. It isn’t obscene but it was a bit difficult for me to get past the British vocabulary. I heard “ain’t” more times during the play than I have in my life! S-27 is a tough ticket, plan ahead to ensure you get to see it.